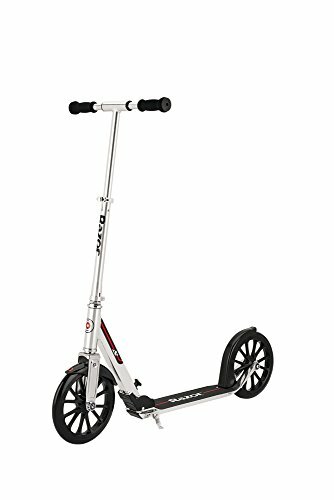 What is the safest adult kick scooter? Can adults ride kick scooters? Once thought to be only for kids, more and more adults are realizing that an adult kick scooter is a nifty, convenient, and fashionable alternative to biking and walking. 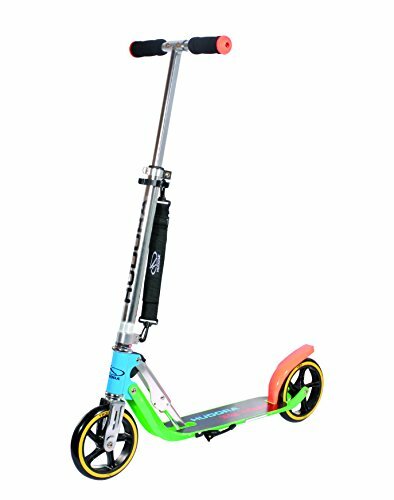 Good kick scooters are safe and long-lasting – not to mention, they’ll take you smoothly over uneven city roads or paved suburban sidewalks. 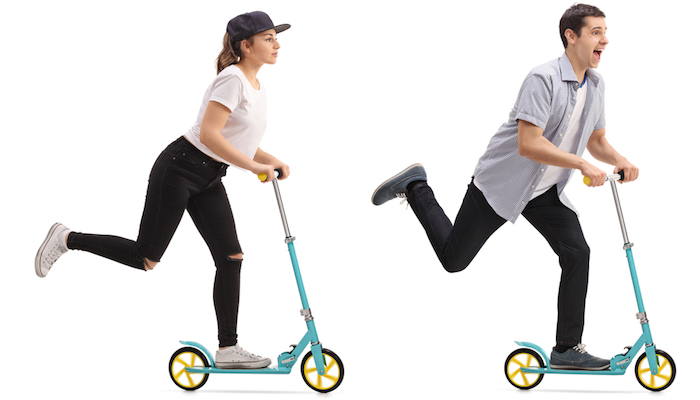 Whether you’re looking to change up your daily commute with a tool that will fit snugly under your desk or just for another way to squeeze in a little extra exercise during leisure times, there’s an adult scooter out there for you! Fancy trying an electric scooter? Try one of these electric scooters for adults. We’ve gone ahead and identified the ten best adult kick scooters on the market, plus we’ve put together a buying guide to help you figure out what works best for you. Let’s take a look! Everything about the Fuzion CityGlide B200 adult kick scooter has been designed with the modern city commuter in mind. 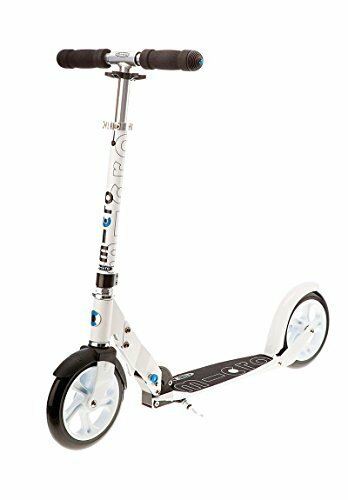 From its sleek appearance to its handy features, this could be considered one of, if not the best kick scooter for adults out there. The oversized wheels are well-suited for gliding over small bumps and uneven roads, and the dual-brake system allows riders to easily and safely stop at a moment’s notice. Its unique folding and locking mechanism also allows for easy storage almost anywhere, making it just right for keeping under your desk or tucked away in a closet. Of course, all these features mean the Fuzion CityGlide B200 works for older kids as well as adults. Why We Liked It – With dual brakes and a compact design, this adult kick scooter is perfect for those with a shorter commute who want a transportation method that’s faster than walking but less clunky than a bicycle. The Razor A5 Lux Scooter is for those who value a good, long glide above all else. 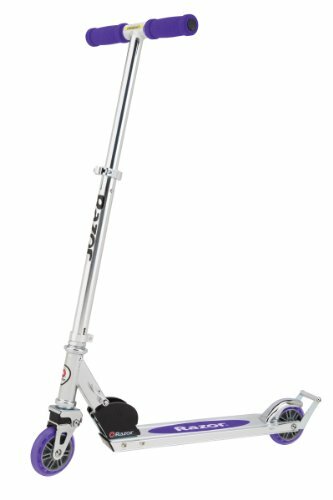 The tall, solid 8” wheels absorb shock and allow for smooth rides when the terrain isn’t – and since they’re coupled with moveable handlebars, the Razor A5 Lux Scooter is the best friend of taller riders. The low deck height, though, means shorter riders won’t have to work as hard to build up the speed they want. Ultimately, the Razor A5 Lux Scooter is made to hit all the key points of a good adult scooter – dual brakes, a kickstand, and a good glide distance that won’t get caught in cracks or on rocks. Why We Liked It – Sturdy. Dependable. Smooth. 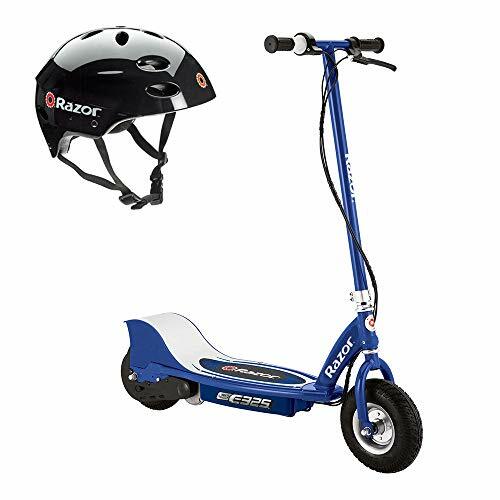 The Razor A5 Lux Scooter is a good choice for older kids, teens, and adults, and an excellent value for those looking to get a great scooter at an affordable price. Razor also offers electric scooters. It’s hard to come by kick scooters for tall adults that have enough height adjustability and a wide enough deck – but the Razor A6 Scooter was made to solve that problem. The deck is 13.4” long, wider than normal to accommodate larger feet, and the handlebars go up to 42”, perfect for adults 6” and taller. In addition, the handlebars are also uniquely designed to be anti-rattle. Many find that handlebars in general tend to vibrate uncomfortably as their scooter goes over bumpy surfaces, and the Razor A6 Scooter aims to address that. As with Razor’s A5 Lux Scooter, the Razor A6 Scooter has everything a good scooter should, with the addition of being made explicitly for taller adults. Why We Liked It – The Razor A6 Scooter fulfills an important niche by providing tall riders with the details they need without sacrificing overall function. Plus, the anti-rattle handlebars are a neat little feature that everyone can enjoy. Many find that the Goplus Folding Glider is a dream to handle – it can tackle any surface with ease and you won’t feel every bump in the road like you would with another scooter. The unusual rubber wheels and shock-absorbing suspension system are meant to allow for a smooth glide, more so than typical scooters. With a maximum height of about 42” and a wider deck area, the Goplus Folding Glider is an excellent choice for all sizes of riders who value an even, steady glide on their scootering journeys. Why We Liked It – The Goplus Folding Glider is perfect for commutes over cobblestone roads and uneven sidewalks. Its folding system takes a few tries to get right, but it’s all worth it in the end for the smoothness of the ride. 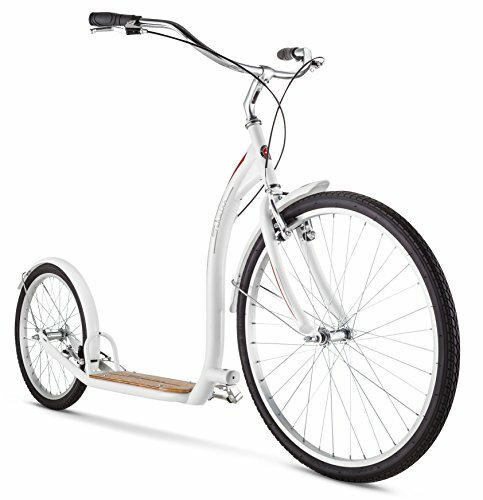 The Schwinn Adult Shuffle blurs the line between bicycle and scooter in the best way possible. The 26” front wheel is comparable to standard bike tires and the 16” rear wheel is also much larger than what’s found on your traditional scooter. The handlebars, too, are in the classic longhorn style that Schwinn bikes are famous for. It has the dual handbrakes, the fenders, and sturdy design of a bicycle, but in the end, the Schwinn Adult Shuffle is still a kick scooter – and a fun one at that. Why We Liked It – If you’re interested in scooters for adults but think they’re for kids, then the Schwinn Adult Shuffle is a stylish way to help you make the transition. One of the oldest choices on the market, the Razor A2 has earned a reputation for its simplicity and reliability. Clocking it in roughly 6 lbs, this adult scooter is also incredibly lightweight and folds easily, making it ideal for taking it on public transportation. The A2 is part of the reason why Razor has endured as such a staple of the kick scooter market. Plus, it’s versatile enough to share with your kids if they’re interested in trying it out. The Razor A2 also comes in black, royal blue, plum purple, deep red, and clear, so pick your favorite! Why We Liked It – The Razor A2 Scooter is for people who don’t need all the bells and whistles. 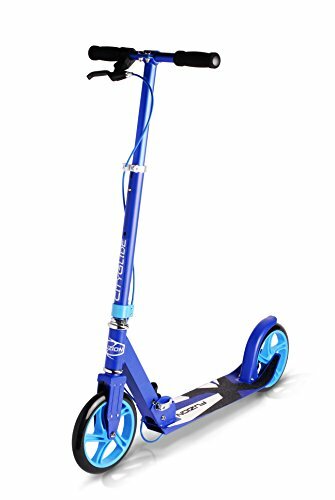 It’s light as a feather, classically designed, and is a good all-around scooter. Coming fully assembled right out of the box, the Hudora 180 is a brightly colored visual treat. 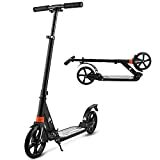 Its shoulder strap and compact folded size are lifesavers when taking this scooter on cramped buses or through crowds, and the single step folding process makes it easy to snap up and go. Special attention was given to the handle grips for maximum comfort. Hudora is a German brand, well-known throughout Europe for good reason: their scooters are incredibly stable. If you’re looking for a scooter to learn on, consider the Hudora 180 to be your guide into the world of scooting. Why We Liked It – The Hudora 180 is a wonderful choice for first-time riders who need a well-made, stable scooter to see them through their trip. Plus, the shoulder strap is a nice little touch. If durability is your main concern, then consider taking the Razor A3 Scooter for a spin. 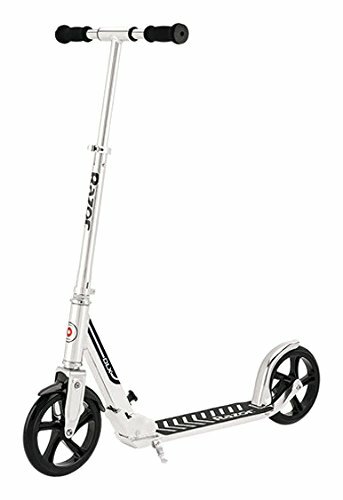 Made from aircraft-grade aluminum and featuring larger wheels than average, this scooter was made for heavy long-term use. The wheels are made from high-quality urethane and are combined with shock-absorbing suspension for smoother rides. The redesigned wheelie bar is also good for simple tricks if you’re brave enough. Another one of Razor’s expert offerings, the Razor A3 Scooter is a no-fuss, sleek tool great for getting from point A to B without too much wear and tear. Why We Liked It – If you think you’re going to be rough on your kick scooter, then everything about the Razor A3 Scooter was made for you. The no-nonsense Micro White & Black shows its quality through the details. This scooter features a few small touches that make it good for adult use. Namely, the lower deck height and taller handlebars are suited for an adult stature. The wheels are wider than average as to make rides over rough surfaces less bumpy, identifying this adult scooter as being one for commuters instead of trick enthusiasts. There’s even a two-year warranty! Overall, the Micro White & Black is good for modern young professionals who want to effortlessly glide through their city. Why We Liked It – The Micro White & Black looks as good as it rides. It’s a great upgrade from more basic scooters without being clunky or complicated and is well-designed for urban environments. The Globber One K 180 is truly unique. From its high-quality materials to its innovative design, no detail is sacrificed when it comes to designing for comfort at an affordable price. 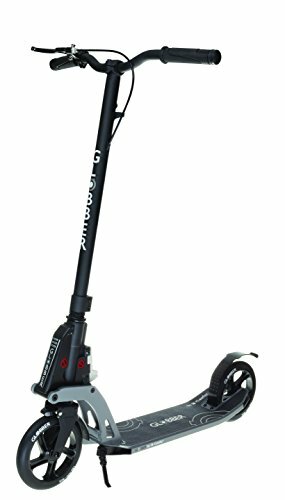 One feature of the Globber One K 180 that you won’t find anywhere else is the ability to store the folded scooter upright, thanks to its special locking handbrake that keeps the wheels from rotating while resting against a wall. The fixed handlebars are 38.75” from the ground to the top of the squishy, dual-injection foam grips. There’s all also a neat function that lets you wheel the folded scooter behind you, like a rolling suitcase, which makes up for the fact that the Globber One K 180 is a little heftier than average. Why We Liked It – There are no copycats when it comes to Globber. The Globber One K 180 was made for maximum comfort for the city traveler, which you can see in every aspect of its design. If you’ve never ridden a scooter before (or at least not since you were a kid! ), you may not know what features and details to look for. 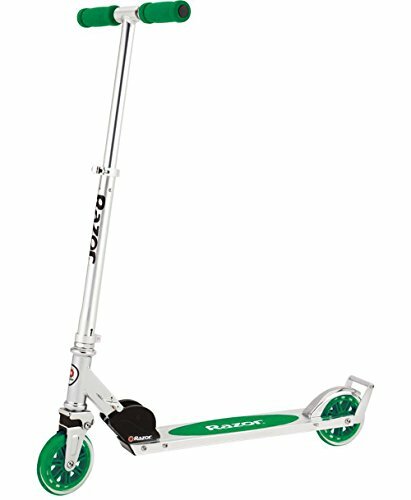 Many adult kick scooters are quite similar at first glance, with only small details to differentiate them in what are ultimately major ways. Here are a few aspects to consider when selecting a kick scooter that works best for you. Some may think kick scooters are only for children, but many adults find them to be useful and fun all the same. When you’re selecting a push scooter for adults, it’s important to consider the context you’ll be riding it in. Do you want one to help with your short commute in an urban area? Do you want to leisurely ride around your suburban neighborhood or your local park? When you know where you’ll be riding, you’ll also be able to assess the terrain you’ll be riding on. 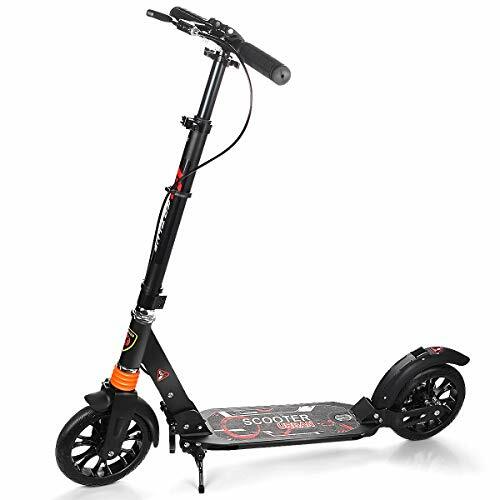 If you’ll be going over a lot of cracks or uneven pavement, you’ll want to select a scooter with larger wheels to avoid any sudden stops or falls. If you’re going downhill, dual braking systems may help you to control your speed during descents. Because everyone has different needs, there is no one perfect scooter for everyone. It’s up to you to decide what’s most important. Do you want the smallest, most compact scooter that may not fit your feet comfortable during a ride? Are you willing to ride a bulkier scooter if it means your rides are smoother? How important are appearance and colors to you? Answering these questions will help you decide what technical aspects are important to you. Wheel size and quality are some of the most important features of any scooter. They can be made of a variety of materials, most commonly urethane or polyurethane, or sometimes rubber. Larger wheels are often more durable and allow riders to go over cracks and bumps in the road without abruptly stopping, but they can contribute quite significantly to the overall weight of a scooter. Smaller wheels are good for sharper turns and changes in speed but can be dangerous on uneven surfaces. Wheels can also vary in width, with wider wheels being bulkier but significantly more stable over rough terrain. Generally, the front and back wheels are the same sizes, but there are exceptions to this. If you ride a lot, wheels can wear down over time, but you can easily replace them yourself or at your local bike repair shop. Handbrakes aren’t necessarily common on adult kick scooters, but they’re an important safety feature that shouldn’t be forgotten. If your handbrakes see a lot of use, make sure to visit a local bike repair shop from time to time – they can likely help keep your brakes from succumbing to overuse. The vast majority of scooters will have a rear wheel brake that allows for friction braking, but using it can take some time to get used to if you’ve never ridden a push scooter for adults before. A handbrake may add to the cost of your ride, but we recommend them for people who are new to scooting or are otherwise concerned about safety. Many find that standard brakes aren’t sufficient to totally come to a stop when rolling downhill or in the rain – you’ll just slow down instead. This is common to the vast majority adult scooters, and it’s suggested that you avoid riding in the rain (which also helps avoid rust) and walk down steeper slopes. The deck is the horizontal part of a scooter that you place your non-kicking foot on. It can be made of a variety of materials and sometimes will include grip tape, like what’s found on a skateboard. Bigger decks, generally made out of sturdier material and tend to be longer/wider than average, are more durable and comfortable for longer rides, at the expense of being heavier. Larger riders may need an appropriately-sized deck to adequately support them, whether it be a deck that’s wider, longer or both. Wider decks allow more space for your feet to sit side-by-side and makes switching your kicking foot easier. Longer decks are to accommodate larger shoe sizes, so your shoe and foot will fit comfortably when placed flat and parallel to the deck. Standard decks generally fit up to a men’s size 12 shoe, so keep that in mind if that’s going to be a factor during your selection process. The vast majority of scooters allow you to adjust the height of the handlebars to suit your physical needs, but some don’t. Non-adjustable ones tend to suit adults between the heights of 5”1’ and 5”11’, so be careful if your height falls outside that range. A good handlebar post height will allow you to stand comfortably upright. The bend of your arms should be 90 degrees or wider, but not so wide that you lean forward. Deck heights are generally not adjustable on most scooters unless you swap in smaller or larger wheels. Not all scooters fold up for storage and transportation, so if portability and compactness are important to you, be on the lookout for scooters that are foldable. Weight can also be an important factor in kick scooters for adults commuting, with lighter scooters closer to six pounds and heavier ones upwards of 12. Weight may not be an important factor for most, but it can be critical if there are stretches of your commute where you have to carry your scooter. Shoulder straps and handles can be useful, but consider storing your scooter in a bag if you need a way to carry it. In a general sense, the safest option is one that is best suited to your height and weight. You’ll want a scooter that is made from high-quality materials and has features like handbrakes. In particular, we recommend the Razor A6 and the Globber One K 180 for those who are extra concerned about safety. And of course, make sure to wear a helmet at all times when on any scooter! Absolutely! There are more adults riding scooters out there than you’d think. Many find them to be a viable alternative to walking or biking for their daily commute, zipping around campus, or just for their daily exercise. If you have kids of any age, riding together on scooters can be a fun way to spend time together outdoors. Don’t be afraid to ride a kick scooter for adults. You may feel silly at first, but over time you’ll come to feel confident about the fun and ease of gliding around. Many of the best kick scooters for adults can be customized and further adjusted for the DIY-ers out there. The changes you make can be cosmetic, like adding stickers, or more technical in nature, like replacing the bearings or changing the wheels. So don’t be afraid to get creative and personalize your ride! One of the pioneers of scootering was none other than Amelia Earhart, who could often be spotted using one to make getting around airports faster in the 1930’s. Kick scooters for adults are a convenient transportation option for people of all ages. With our guide, we hope you pick the right scooter for you. In the end, think about where and when you’ll be using your scooter and what kind of features are important to you so you can have a fun, confident ride. Happy scooting!